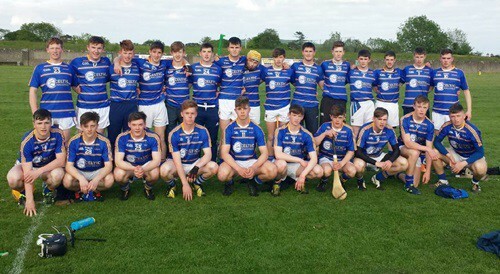 North Clare defeated Roscommon by 3-18 to 2-11 in Round 4 of the Celtic Challenge Under 17 Hurling competition on Wednesday May 25th at Padraig Pearses, Woodmount, Roscommon. This entry was posted on Wednesday, May 25th, 2016 at 3:18 pm and is filed under events, News. You can follow any responses to this entry through the RSS 2.0 feed. Both comments and pings are currently closed. South/East Clare defeated Galway City/West by 5-21 to 1-16 in Round 4 of the Celtic Challenge Under 17 Hurling competition on Wednesday May 25th at Tubber. This entry was posted on Wednesday, May 25th, 2016 at 3:17 pm and is filed under events, News. You can follow any responses to this entry through the RSS 2.0 feed. Both comments and pings are currently closed. Limerick City defeated West Limerick by 1-18 to 1-7 in round 4 of the Celtic Challenge Under 17 Hurling competition on Wednesday May 25th at Rathkeale. This entry was posted on Wednesday, May 25th, 2016 at 3:15 pm and is filed under events, News. You can follow any responses to this entry through the RSS 2.0 feed. Both comments and pings are currently closed. Kerry defeated North Cork by 1-20 to 1-12 in round 4 of the Celtic Challenge Under 17 Hurling competition on Wednesday May 25th at Milford. This entry was posted on Wednesday, May 25th, 2016 at 3:14 pm and is filed under events, News. You can follow any responses to this entry through the RSS 2.0 feed. Both comments and pings are currently closed. 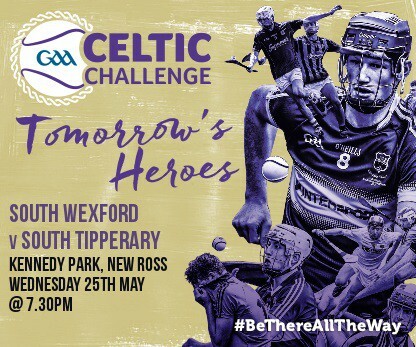 South Wexford defeated South Tipperary by 3-15 to 1-14 in Round 4 of the Celtic Challenge Under 17 Hurling competition on Wednesday May 25th at New Ross. New Ross was the venue for South Tipperary’s fourth round Celtic Challenge game against a classy South Wexford selection who denied the visitors a third victory in a row. South Tipperary who lined out with Cormac Maher in at midfield for the unavailable Andy Byrnes had a productive opening 11 minutes which culminated in an opportunistic goal from Niall Hoctor to leave the score line 1-3 to 0.1. Following a slow start South Wexford gradually took control of the game and some excellent teamwork resulted in seven unanswered points. South Tipperary responded before half time with points from Conal Donovan and Cathal Bourke (2) to leave a point between the sides at the break in South Tipperary’s favour. The half time score was South Tipperary 1-6 South Wexford 0-8. The second half opened disappointingly for South Tipperary with a quick goal for South Wexford by Sam Wall. The hard working Cathal Bourke responded for the visitors with two points from frees and one from play but within minutes James Kelly raised a green flag for South Wexford. Bourke responded with a great individual point and a subsequent pointed free but South Wexford were beginning to score freely and to dominate in many positions on the field. When Wall scored his second goal for South Wexford the writing was on the wall for South Tipperary but to their credit they battled to the end and finished the game with points from Ross Bonner and Jack Lyons (2). For South Tipperary this was a case of not playing to their potential but of being deservedly beaten by a superior team on the night. Paul O Heney, Fiachra Scott, Conal Donovan, Niall Hoctor, Cathal Bourke and Jordan Hayes were the most prominent players for South Tipperary whereas for South Wexford the performances of Ben Maddox, Jamie Myler, Chris Cowman, Sean Nolan, Kyle Firman and Sam Wall were among the many impressive South Wexford performances on the night. South Tipperary’s final game in the group stages of the competition will take place on Wednesday 1st June @ 7.30pm at a South Tipperary venue. This entry was posted on Wednesday, May 25th, 2016 at 3:13 pm and is filed under events, News. You can follow any responses to this entry through the RSS 2.0 feed. Both comments and pings are currently closed.